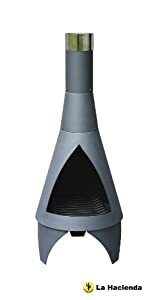 Garden incinerators & Fire Pits are currently presenting the fantastic Colorado Chiminea at a great price. Don't pass it over - purchase the Colorado Chiminea here now! Medium contemporary steel chimenea in matt black finish with chrome plated collar, log grate & metal tool. Measurements: H - 125 x Diameter 45cm Please allow 3-5 working days, as this is direct from the supplier.